You are here: Home / Ethnic Groups / The People of Sumatra / Who are the Belide? The Belide live in the Muara Enim Regency of South Sumatra Province. Even in their home area, the Belide people live alongside the Javanese, Rambang and Ogan people. 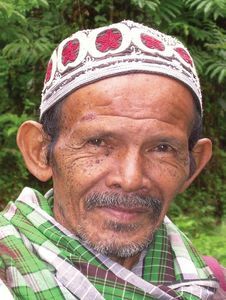 The Belide people have their own Malay dialect which is related to surrounding dialects. They can easily understand the Ogan, Meranjat, Lematang, Enim and Rambang dialects. The Belide also speak and understand the Palembang language. The Belide dialect is part of the Musi language which also includes the Musi, Palembang, and Lematang. Traditionally, houses in Sumatra were built alongside a local river. Most roads in Sumatra today are not far from a river and usually follow a similar course. As a result, many people have begun to build their houses alongside roads instead of rivers. The Belide, however, follow the older practice and still live in houses on the banks of rivers, far from most roads. Most Belide live in traditional houses which are raised above the ground on wooden or brick columns. Today, many Belide are building modern two-story houses. Two-story houses are becoming a trend in South Sumatra, with modern-style houses being built alongside traditional raised houses. The Belide also possess a form of writing called Tulisan Ulu. This writing system is a syllabary system in which each symbol represents a syllable. Among the Belide only a few older people still use this kind of writing. Belide people profess Islam as their religion and are officially registered as Muslims. They often claim, “We are all Muslims.” However, the Belide still retain many animist and spiritist beliefs. Evidence of this is the many superstitions and taboos enforced in Belide areas. For example, residents are forbidden to grow durian in some parts of the Belide area because, according to a local legend, one of their ancestors was killed when a durian fell and struck him. As a result, the man’s parents placed a curse upon anyone who grows durian trees in the surrounding area. Thus, residents of this area do not cultivate durian. The Belide also observe superstitions regarding bathing. A person who bathes in the river is not allowed to turn his back to the river, but must face the river. They believe that a person who breaks this rule will die. The Belide are also not allowed to get in the river to bathe. They must stay on the riverbank and take water for bathing from the river with a dipper instead of swimming in the river. These examples demonstrate a syncretistic form of Islam, which incorporates traditional animistic beliefs. Animistic beliefs appear to dominate Belide practices, rather than Islamic teaching. Even though Sumatran roads pass through the Belide areas, the Belide are not accessing the benefits of modernization. They tend to live next to rivers or other bodies of water rather than near the main roads. They might be greatly helped by efforts to raise their awareness of the resources available to them in their area.